Above and beyond isn’t enough to describe these grantees. Each month, we’ll be featuring a new interview with an organization from our NEA Big Read community. 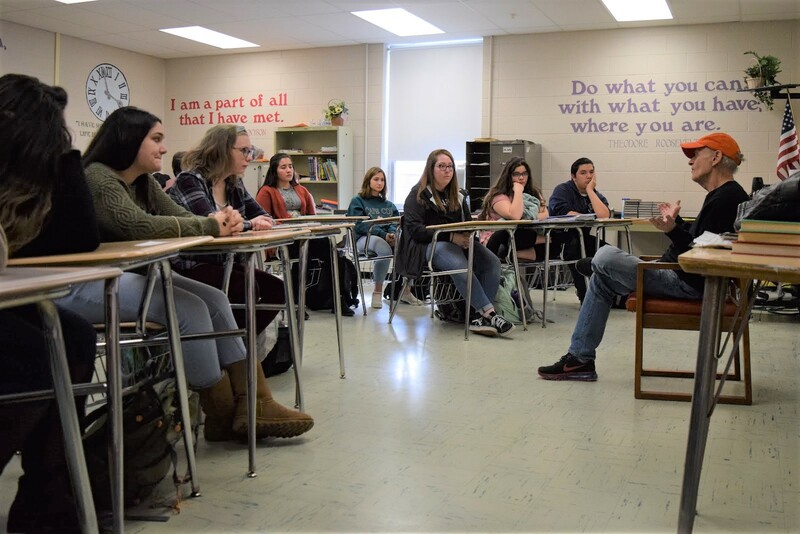 This month, the Foster-Glocester Regional Schools share the impact of Tim O’Brien’s The Things They Carried on their community, and the intergenerational connections that grew from their NEA Big Read programming in 2018. 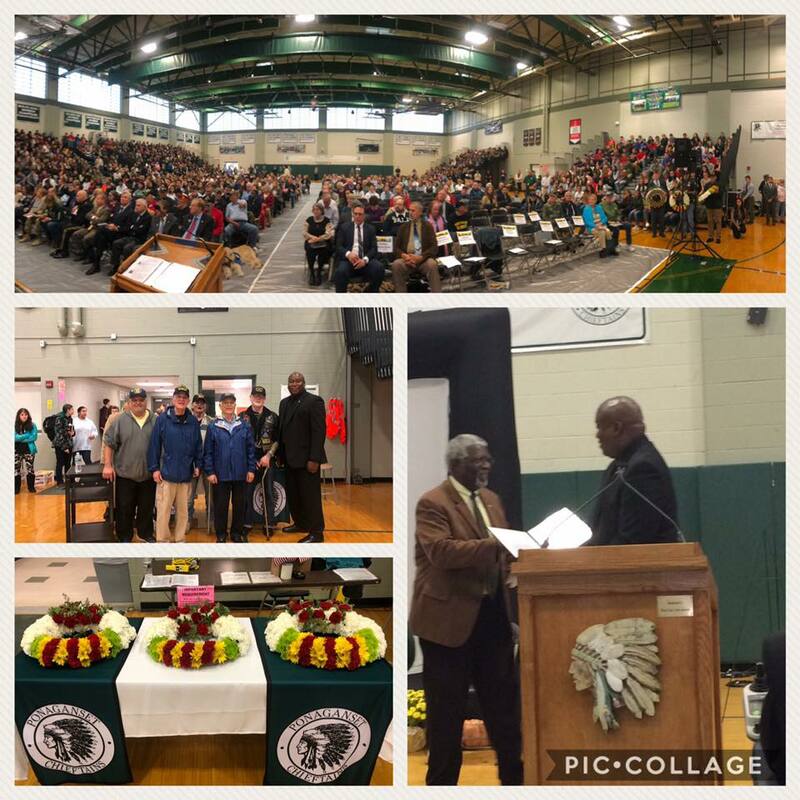 The Foster-Glocester Regional School District is comprised of two schools, Ponaganset High School and Ponaganset Middle School, servicing 1147 students from both towns in grades 6-12. Foster Glocester Regional Schools provides students with a supportive and cutting-edge learning environment. We offer a high quality academic education, state-of-the-art facilities, and rigorous college and career pathways designed to provide students with a competitive edge. Our school provides a rigorous, collaborative, relevant, and personalized education supported by the latest technology. The rural towns of Foster and Glocester, Rhode Island and are located 30 minutes to the west of Providence. There are few major businesses or industries located in the towns of Foster and Glocester and the communities are underserved in cultural and artistic programming. Foster and Glocester each have two small public libraries: Foster Public, Tyler Free, Glocester Manton Free, and Harmony Libraries who were our partners in the NEA Big Read. Because of our close-knit, small community many of our connections and much of our fundraising were comprised of grassroots efforts with local veteran, library, and volunteer public service groups. What made your NEA Big Read unique? Because of the “smallness” of Rhode Island, our NEA Big Read was a statewide community event. Our kick-off and keynote addresses drew individuals and groups from all over the region. Our faculty and students were able to make impactful curriculum connections to the veteran community of Rhode Island resulting in a truly intergenerational experience. The Things They Carried has been a core novel in our school district’s English curriculum for many years, so having Tim O’Brien come to work with our community and students was a phenomenal experience. Veterans, who were involved with Moving Wall activities, adolescents, who were curating oral histories and young children who were involved in a community writing workshop all engaged with our selection from many different perspectives. English Language Arts students speaking with author Tim O’Brien about the writing process. Photo courtesy of the Foster-Glocester Regional Schools. Part-memoir, part-fiction, The Things They Carried follows a platoon of infantrymen through the jungles of Vietnam. We see them trudge through the muck of a constant downpour, get hit by sniper fire, pull body parts out of a tree, laugh while they tell their stories to each other, and fall silent when faced with making sense of it all. Far from a combat story of pride and glory, it is a compassionate tale of the American soldier, brimming with raw honesty and thoughtful reflection. The Foster-Glocester School District has a rich history of teaching, remembering, and honoring our veterans and their service to our country. 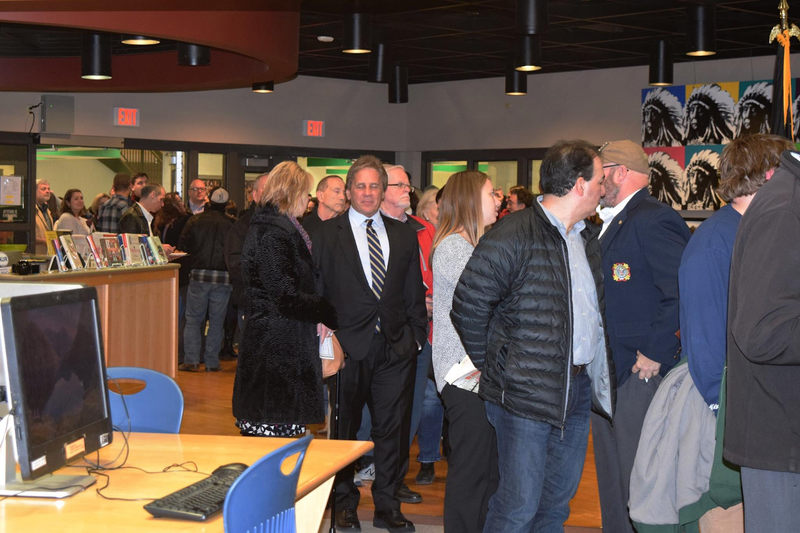 The Vietnam Memorial Moving Wall project complemented and built upon a Wreaths Across America (WAA) celebration that has been occurring at Ponaganset Middle School for the past decade. The Moving Wall Project involved hundreds of students, community members, and veterans surpassing our overall expectations. This project enabled students to gain a deeper understanding of our history and the service of our veterans and their families. Students engaged in an extended period of research as they sought answers to complex questions and problems across multiple subjects. 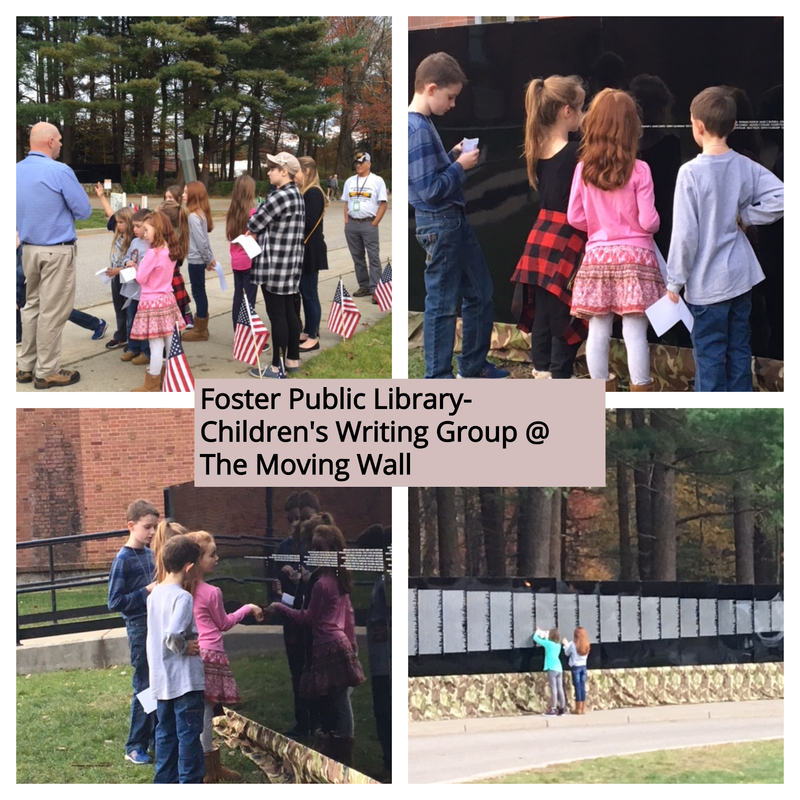 These learning experiences culminated with the viewing of the “Moving Wall” by our students, students from other schools, and the veterans and residents of our State. The project extended well beyond our expectations as the Foster-Glocester Regional Schools also partnered with the Foster and Glocester public libraries, veterans’ organizations, and local businesses in both communities to present intergenerational programming surrounding The Things They Carried. 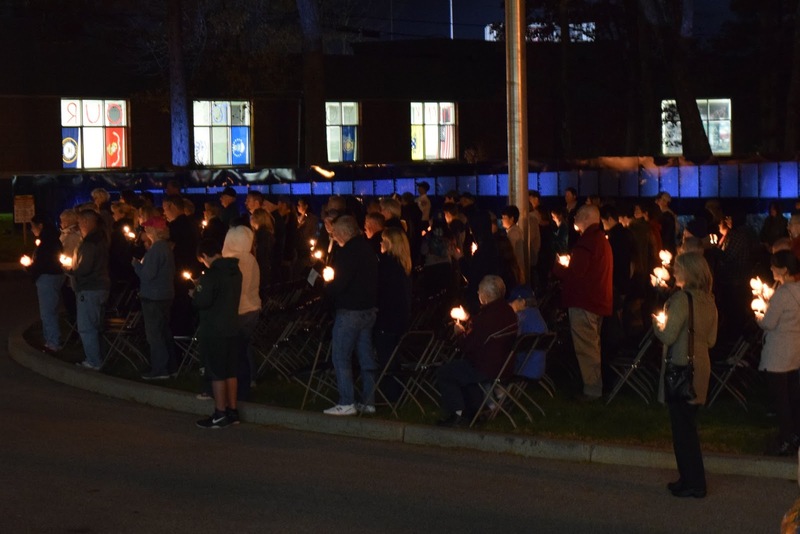 We used the Candlelight Vigil as an opportunity to distribute 500 free copies of the book to community members during a reception featuring the Ponaganset High School Jazz Ensemble performing music of the Vietnam era. Nevertheless, one of the most unexpected outcomes of the project was its reach. The project extended far beyond the communities of Foster and Glocester and brought visitors from every corner of New England and the Mid-Atlantic states. Students, residents and veterans alike embraced the project and the State of Rhode Island saw fit to illuminate the dome of the RI Statehouse in the colors of the Vietnam Service Ribbon between November 1st and 5th while the District hosted the Moving Wall. Students at The Moving Wall Project. Photo courtesy of the Foster-Glocester Regional Schools. One of the main objectives of this experience was not only to improve students’ professional skills of communication, collaboration and goal setting but more importantly it to raise awareness about the realities of Vietnam veterans and their families. As a result, these activities instilled in students a sense of inclusiveness, diversity, belonging, and respect for others. They understood the ugliness and horrors faced by those who lived through the Vietnam Era. They spoke face-to-face with four Vietnam Veterans featured in Ken Burns’ film The Vietnam War: Rhode Islander Wayne Smith, poet and author John Musgrave, educational leader Dr. Roger Harris, and celebrated author Tim O’Brien. This aspect was most impactful because they ensured that history did not take place in some distant land but in their own backyard. They learned from over 100 Vietnam Veterans and worked alongside 169 volunteers who came from every Rhode Island community. Over 1000 people attended Wreaths Across America services at Ponaganset High School. Photo courtesy of the Foster-Glocester Regional Schools. People tend to discover the joy of History and English later in life. In high school, they tend to dismiss these subjects as boring and tedious. To many students, these subjects mistakenly mean reading long-winded, exceedingly dry textbooks or drilling innumerable facts into their heads. They don’t necessarily see the importance of studying something that happened fifty years ago. Therefore, we tried this year to get younger people to really care about what they’re learning. Doing so involved bringing the subject to life for them. The Vietnam War now feels more real to our kids as they participated in the interactive and immersive activities over the past few months. A program is successful when a community enters into a conversation about a topic. In our case we facilitated a deep and often painful examination of the Vietnam War in connection with O’Brien’s work, The Things They Carried. While our efforts include an ambitious schedule of school and community events taking place throughout the months of November, December, and January it was the veteran’s stories that afforded our students the opportunity to truly understand the price we all pay when we go to war. Tim O’Brien, John Musgrave, Roger Harris, and Wayne Smith (who all appeared in Ken Burn’s film) told stories. They evoked something student’s keep buried deep inside of themselves. As Mr. O’Brien asserted, our job is to make our students learn facts but to also get their “…stomachs to churn and their tongues taste that sour, metallic lemonade that creeps up your throat when you sense real fear.” Our students learned and they learned not from a cold, mechanical textbook but through the power of a story. The program was successful because it helped us to compete with the distractions of technology and find a way to truly engage our students. They were moved by Mr. O’Brien’s stories and because of this, they will carry Vietnam with them forever. Tim O’Brien speaking. Photo by Beth Kelling, courtesy of the Foster-Glocester Regional School District. Community members wait to meet Mr. O’Brien at the reception/book signing following the sold-out Keynote Address. Photo courtesy of the Foster-Glocester Regional School. The visual exhibit was one of the most creative representations of our student’s research and interpretation of the Vietnam War’s significance in history. The completed exhibit appeared a lot like a limited exhibition you might see in a museum. Creating the exhibition class gave students the opportunity to explore the Vietnam War in depth and express their arguments in a public forum. In addition to the text they wrote, they used things like timelines, maps, graphs, charts, photographs, paintings, and physical artifacts to tell the story of Vietnam War. They also incorporated primary sources into their exhibits – including quotations, letters, newspaper articles, and more. By piecing these visual elements together, they developed a rich and informative narrative of the Vietnam War. The display took on an almost three-dimensional quality that brought history to the foreground. The jazz band’s performance of 1960’s era music during a gala reception enhanced the overall experience, giving those who lived through the decade a sense of deja vu! Ponaganset High School Senior, Emily Williams, wrote in a reflective essay after programming, “There are a few occasions where I felt such a strong community bond in my school that it could only be described as a family.” History was brought to life as several men who appear in Burn’s film shared their stories with students in the flesh. However, our favorite story comes from Mr. O’Brien himself after having spent a long day working with students in the classroom. That evening, during his keynote address, he opened with a waggish apology musing, “I usually spend most nights sitting in my underwear in front of a computer writing stories. 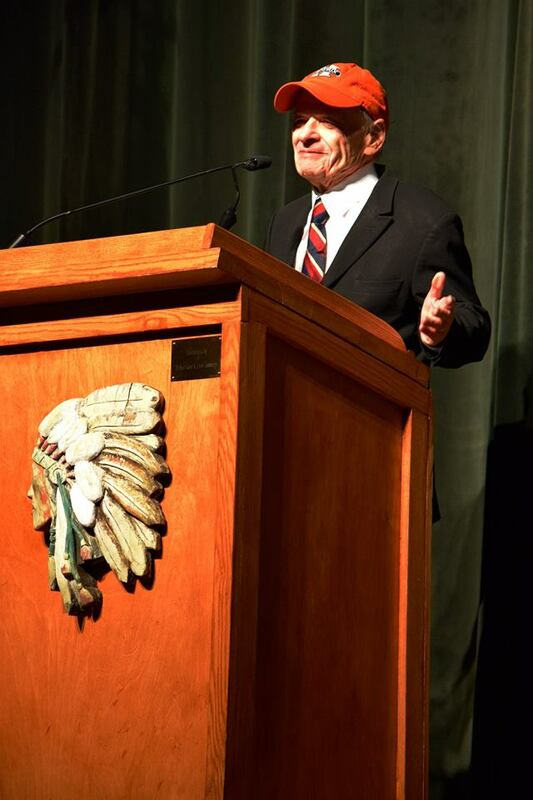 I am not a public speaker.” He then went on to deliver an evocative and mesmerizing account of war that was in his words, “unsanitized.” His eloquence was rewarded by a thunderous standing ovation. Community members attend the Candlelight vigil at the Moving Wall NEA Big Read Kick-off event. Photo courtesy of the Foster-Glocester Regional Schools.